Exposure has been something that I’ve mostly avoided. Invisibility was my superpower and, in doing seasonal work, I moved a lot and had many opportunities for self reinvention. When exposure happened, it was oftentimes painful as the spotlight of scrutiny can make your shadows more pronounced. Things would get hard, Iwould get sad, angry or scared, I’d feel exposed and then I would move. There’s a great song that warns about such a life. About a year ago, I was invited to give a talk through Real Food Real Stories. It was an opportunity to share some things that I had been working on; The origins of The Gypsy Fish Company, using psychedelics to heal trauma, art and it’s place in self reflection… The talk ranged widely and freely as it was the culmination of a period of deep personal introspection. Throughout it, I could feel how dialed in the audience was. Feeling seen and heard, feeling vulnerable but received – it was as if all those eyes looking in on me made me see myself more clearly. 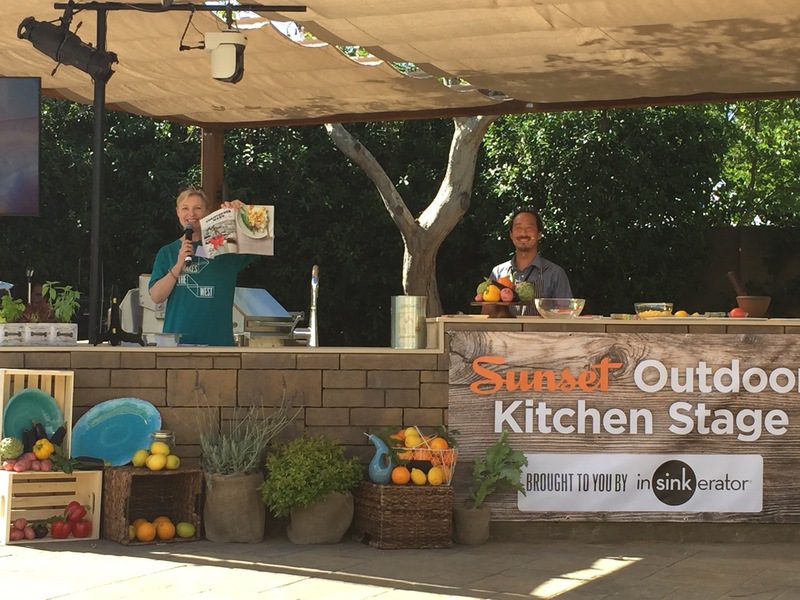 At the beginning of this year, Margo True, the Food Editor at Sunset Magazine reached out to me. She had been reading this blog and was inspired to do a feature on memories and food. She invited me to contribute a recipe as well as participate in Sunset’s Celebration Weekend in Sonoma by cooking a demo meal in front of an audience upwards of 200 people. It was January. I was bundled up and standing on the deck of my friends’ farm in Southern Oregon – out of earshot of restless kids but also out of the coddling warmth of the wood stove. May felt far, far away as did the sun kissed vineyards of Sonoma. As the winter progressed, the article became more of a reality. Emails back and forth with Margo. A phone interview. A photo shoot in March. Everyone that I came into contact with through Sunset was genuine and warm. Rather than looking to present an image, it seemed like they were seeking to draw out the essence – of flavors… Of me…..
Then the demo began to loom nearer. Family from overseas were going to be in town. GULP! Housing and ticketing logistics. UGH! And, the meal itself…. GULP! Plus, my mom’s going to be there! AAaaack! A week ahead, I scratched out some notes and polled some people for talking points. Nobody responded. What was I going to talk about? Founded in 1898, with offices in New York, Chicago and California, a wide and international readership and falling under the even larger umbrella of TIME Inc. Sunset is a huge organization which, despite all this, has not lost it’s familial vibe. From high fiving the Editor in Chief, Irene Edwards to having cocktails with travel dept late night, everyone we came into contact with at the event was genuinely warm and always helpful. Especially Margo who, despite having a bazillion things to do, made time to connect, meet my mother and offer reassuring encouragement for the demo. This level of authenticity can’t be faked. So much of what we see nowadays is a curated, front facing image. But you can’t actually manufacture genuine warmth. The demo went great. Nervous? Yes. Excited? Yes. Speaking quickly? Probly?…. But I find it fun to connect with people and share things that I love. Salmon. Food. Words. And that momentum propelled me through the self judgement and let me loosen up and enjoy the moment. As the magazine has started to be released throughout the country, folks are reaching out and sending pictures of themselves preparing the recipe that was created for the issue. (#gypsyfishfood). It’s exciting to think that people whom I have never met may seek out some wild salmon, produce at their local farmers market, friends to join them for a meal and then use this recipe for the centerpiece of a gathering. A chance to sit down to eat and build the bonds that bring a family together. The same bonds that create the foundations of a larger community. To play any small role in such alchemy …that’s REALLY exciting. Risk and fear walk hand in hand with exposure. In any situation that is forward facing, the audience brings their own experience to the moment and we risk being misunderstood. As much as we want to control outcomes, we can only be honest. The audience brings a lifetime of experience, mixes it with what’s being presented to them and then takes from it what they will. Exposure is a chance to look through fear, find our own truths and, perhaps, to share them widely. I’m really indebted and grateful to the people and organizations that open the doors and shed light on folks like me. Pei-Ru and the crew at Real Food Real Stories, Irene and Margo and the folks at Sunset Magazine – Thanks so much for widening the band of light that we can shine beneath. It inspires me to grow into that space, to peer inside more deeply and to, hopefully, share more widely. Thanks Rachel! It’d be great to connect sometime. I always appreciated your mission and continue to do so. Good to hear from you. Yes, would love to get together, find out what you have been up to….salmon fishing? Let me know when you will be in the Sonoma area again.